Chairman Raúl M. Grijalva (D-Ariz.) has been a conservation leader since his time on the Pima County Board of Supervisors, where he successfully championed the landmark Sonoran Desert Conservation Plan to protect the fragile Sonoran Desert ecosystem from overdevelopment. The plan, which the Friends of Saguaro National Park called “visionary” and “exemplary,” has steered endangered species protections and land use planning in Southern Arizona for more than a decade and has provided a model for other communities to follow. After leaving the Board of Supervisors in 2002 to run successfully for Congress, Rep. Grijalva joined the House Natural Resources Committee and became one of Congress’ most outspoken champions for endangered species, wilderness, national parks, public lands and stronger oil and gas regulations. He authored the National Landscape Conservation System Act and the Federal Lands Restoration Act, both of which President Obama signed into law as part of the Omnibus Public Land Management Act of 2009. In 2011, he and Sen. Tom Udall (D-N.M.) requested a formal Government Accountability Office study of the value of hardrock minerals extracted from public lands. The landmark report, issued in 2012, found that because industry record-keeping requirements are so lax, it is impossible to assess the value of hardrock minerals mined on public land. The report underscored the fact that the Mining Law of 1872 has never been updated and that mining companies still pay no royalty to the public on the value of minerals taken from federal land. Since that report was issued, Rep. Grijalva has introduced a number of bills to improve reporting requirements, clean up abandoned mines and establish a first-time public royalty for public lands mining. Since becoming Ranking Member in January 2015, Chairman Grijalva has focused on diversifying the environmental movement beyond traditional activist groups, holding a number of Capitol Hill roundtables with women’s groups, Latino organizations, Native American tribes and other communities traditionally underrepresented in environmental decision-making. He continues to lead an effort supported by multiple tribes to establish the Greater Grand Canyon Heritage National Monument, which would protect the Grand Canyon watershed and sacred Native American historical and cultural sites. In September 2016 he traveled to the Standing Rock Sioux camp in North Dakota to support tribes’ insistence on full consultation before the completion of the controversial Dakota Access Pipeline. He received a perfect 100% score on the National Parks Action Fund scorecard for the 114th Congress, highlighting his continued role as a national leader on public lands conservation. 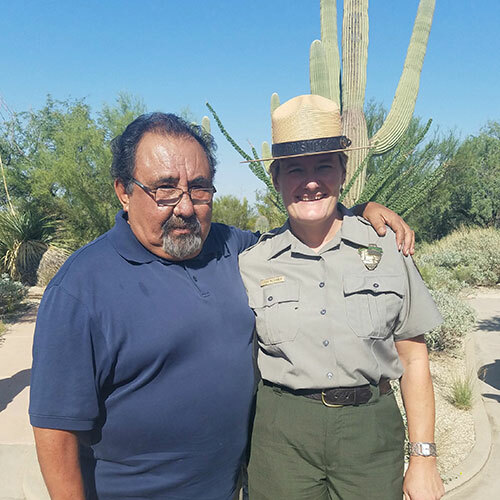 Rep. Grijalva remains Congress’ foremost advocate for protecting our open spaces, defending tribal sovereignty and treaty rights, respecting our bedrock environmental laws, and balancing our nation’s economic activity with long-term planning and environmental stewardship.